Stunning upgrades await you from the moment you enter this lovely entertainers home. Brazilian wood accents surround custom flooring, hardwood staircase, custom murals make you feel like you're in a tropical forest, and beautiful views from both the front and backyards. Granite coutertops in kitchen, cozy fireplace in family room, downstairs bed/den with glass French doors. Thousands spent on outdoor kitchen, Viking appliances and bbq with covered patio and pizza oven to enjoy with family and friends while taking in gorgeous sunsets. Rose bushes and lemon tree fill the backyard.Large dining room and bar area niche off kitchen for more large gatherings.Spacious master suite with huge bathroom and closet, plus loft converted to make plenty of room for guests or a large family.Three car garage for all of storage needs. Newer oversized air conditioning unit. Sparkling community pool with peaceful serene setting. 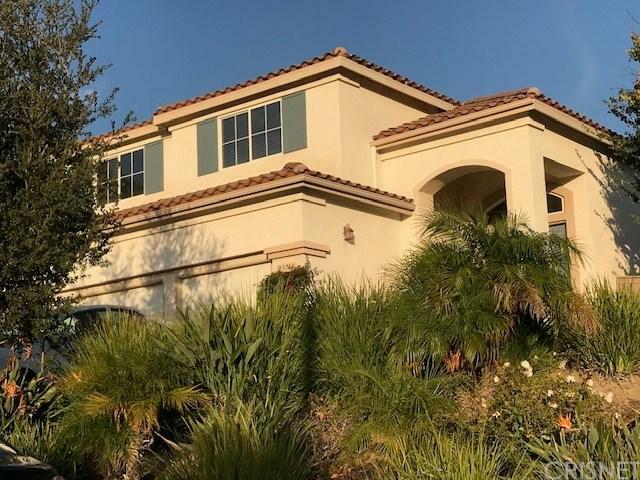 Fantastic access to all Santa Clarita has to offer. Great freeway accessibility and great proximity to shopping, malls, theaters, etc. Homes in this enclave don't become available often, so grab the opportunity while you can.